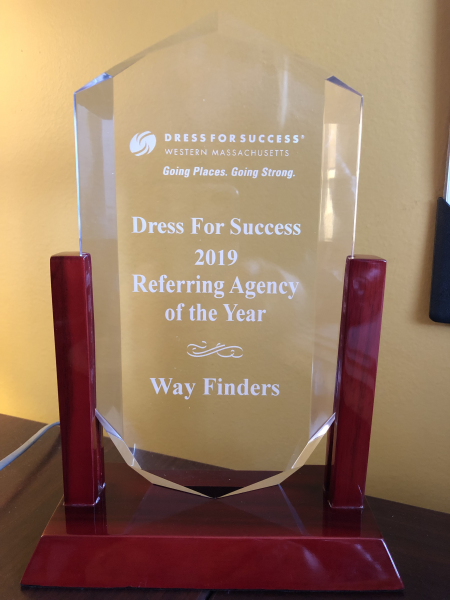 Way Finders was recognized as this year's 2019 Referring Agency of the Year by Dress for Success Western Massachusetts at their Annual Referring Agency Breakfast held at Mercy Medical Center on April 5. Dress for Success is a nonprofit organization that works with women to prepare them for the workforce by providing interview suiting and work attire as well as offers training and mentoring for women entering the workforce. Way Finders' Employment Support Services team and Economic Mobility Teams were recognized for their hard work and dedication to the families they work with. In addition, our own Maegan Pedemonti, Manager of Employment Support Services, co-chairs the Dress for Success program committee and recently joined the board of directors. Thank you to Dress for Success for this honor and congrats to all the women who have been suited through Dress for Success!